The objective of the CO2-DISSOLVED project (CO2 Dependable Injection and Storage System Optimized for Local Valorization of the geothermal Energy Delivered) is to assess the technical-economic feasibility of a novel Carbon Capture and Storage concept integrating aqueous dissolution of CO2 and injection via a doublet system (i.e. one injection well and one production well), an innovative post-combustion CO2 capture technology, and geothermal energy recovery. Compared to the use of a supercritical CO2 phase, this approach offers substantial benefits in terms of storage safety, due to lower brine displacement and no pressure build-up risks, lower CO2 escape risks, and the potential for more rapid mineralization. However, the solubility of CO2 in brine will be a limiting factor to the amount of CO2 that can be injected. Consequently, and as another contributing novel factor, this project targets low to medium range CO2-emitters (ca. 10-150 kt/yr), that could be compatible with a single doublet installation. Since it is intended to be a local solution, the costs related to CO2 transport would then be dramatically reduced, provided that the local underground geology is favorable. 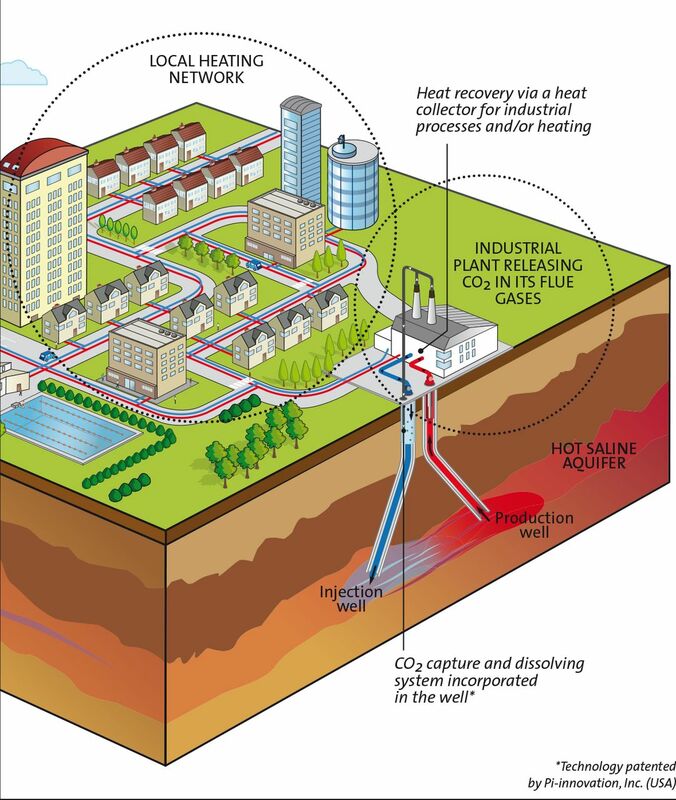 Finally, this project adds the potential for energy and/or revenue generation through geothermal heat recovery. This constitutes an interesting way of valorization of the injection operations, demonstrating that an actual synergy between CO2 storage and geothermal activities may exist. CO2-DISSOLVED_INJECTION: a 4th project is launched!